Rhinoplasty (commonly called a “nose job”) is a plastic surgery procedure that involves reshaping various features of the nose. It can be either a cosmetic procedure performed to enhance the appearance of the nose, a medically necessary procedure to improve nasal breathing, or a combination of both. Primary rhinoplasty refers to first-time nasal surgery—whether for cosmetic or functional purposes—as opposed to revision rhinoplasty, which indicates the patient has had one or more previous rhinoplasty surgeries. Primary rhinoplasty is accomplished by removing excess bone and cartilage from beneath the skin covering the nose. 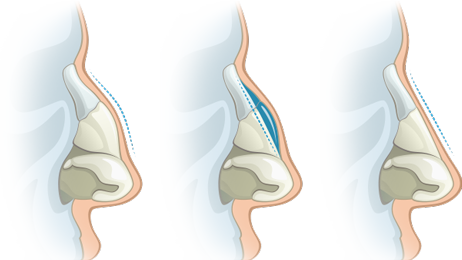 In some cases, cartilage grafts are added to help remodel the nasal framework. After alteration of the supporting structures, the skin is repositioned over the newly shaped framework to give the nose its new appearance. The changes may be subtle or dramatic, depending on the needs of the patient. Dr. C. Spencer Cochran is a renowned rhinoplasty surgeon who is highly experienced in all types of nose surgery. His surgical goal for rhinoplasty is to produce a nose that looks natural, functions properly, and is in balance and harmony with other facial features, thereby avoiding the “operated” look. To learn more about rhinoplasty and Dr. Cochran’s unique approach to nasal surgery, please feel free to explore the detailed sections throughout this page, or contact the Dallas Rhinoplasty Center today to schedule a consultation. What Are the Most Common Reasons People Seek Rhinoplasty? The goal of rhinoplasty for a bulbous (or broad) tip is to create a nose with a more refined tip that is in better balance and harmony with the rest of one’s facial features. This is accomplished by the rhinoplasty surgeon trimming and reshaping the cartilage that provides the tip with its shape. Complex tip reshaping may require an open rhinoplasty whereas minimal bulbousness can sometimes be corrected via a closed rhinoplasty. Most healthy women and men who have never undergone nose surgery are good candidates for primary rhinoplasty. People who have suffered damage to their nose due to an injury and individuals who cannot breathe properly due to nose problems may benefit both on a functional level and with regard to aesthetics by having a rhinoplasty performed. Those who have already undergone rhinoplasty and wish to correct aesthetic or functional problems with their surgically altered noses are better suited for revision rhinoplasty. When you visit our practice for a rhinoplasty consultation with Dr. Cochran, he will perform a careful assessment to ensure you are physically, emotionally, and financially prepared to undergo this major procedure. Each of these candidacy requirements is detailed below. Before undergoing any elective surgery, it is imperative that you be in good general health; this will help minimize recovery time and can reduce the risk of complications. Your safety and wellbeing are Dr. Cochran’s highest priorities, and he wants to ensure your nasal surgery goes smoothly and that your health is not compromised during the procedure. For this reason, you must provide a complete medical history during your consultation. If there are any concerns about your overall health, Dr. Cochran will request that you obtain approval from your general physician prior to scheduling surgery. We cannot stress enough how important it is that patients have realistic expectations about the outcome of aesthetic surgery. While rhinoplasty can significantly improve your appearance, it will not completely change your life. As dramatic as the cosmetic effects of nasal surgery can be, the procedure is not a cure-all. It is simply a means of enhancing and refining your appearance. Those who come to our office with a positive, healthy attitude and a reasonable understanding of what a nose job can accomplish are generally quite pleased with their results. Aside from the physical and emotional considerations, financial matters are often the most significant factor in determining candidacy for aesthetic surgery. It is imperative that you be able to manage the cost of the procedure without jeopardizing your overall financial stability. If nasal surgery is medically necessary (to correct breathing problems, for example), insurance may cover part of the cost. However, you will be responsible for all expenses if rhinoplasty is performed solely for cosmetic reasons. What Sets Dr. Cochran Apart from Other Rhinoplasty Surgeons? 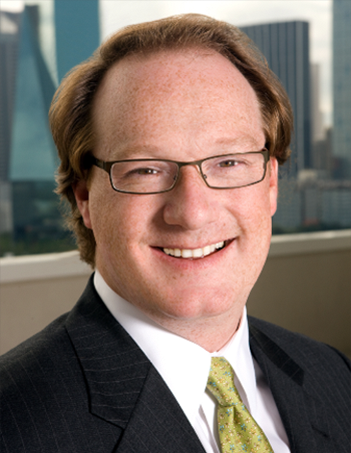 C. Spencer Cochran, MD is a highly respected rhinoplasty specialist and Founder of the Dallas Rhinoplasty Center. Having been in practice with Dr. Jack Gunter for almost a decade prior to Dr. Gunter’s retirement in June of 2014, Dr. Cochran was hand-selected to continue Dr. Gunter’s rhinoplasty legacy. He offers the most up-to-date and cutting-edge rhinoplasty methods and has pioneered many new nasal surgery techniques. His contributions to the field have significantly enhanced both primary and revision rhinoplasty. Dr. Cochran is world-renowned for his rhinoplasty approach and exceptional results. As a lecturer at the Dallas Rhinoplasty Symposium and contributor to the definitive textbook on rhinoplasty and nasal surgery—Dallas Rhinoplasty: Surgery by the Masters—Dr. Cochran has taught advanced methods and techniques for achieving natural rhinoplasty results to hundreds of plastic surgeons. Dr. C. Spencer Cochran is world-renowned for his advanced rhinoplasty techniques and exemplary results. VECTRA® 3D imaging gives our patients a clearer idea of how nose surgery—a procedure that can often alter the appearance of the entire face—can enhance facial aesthetics. How Might I Look After Rhinoplasty? This is often the number one question asked by anyone who is considering rhinoplasty. With the advent of state-of-the-art technology… the answer is getting closer. VECTRA® 3D imaging and Sculptor™ software—developed by Canfield Imaging—allows Dr. Cochran to create life-like simulations of your face that are designed to give you an idea of how you might look once rhinoplasty surgery has been performed. During your consultation, you will be photographed with a special 3D camera to capture various angles of your nose and face. These images are fed into a computer and manipulated with Sculptor™ software to reflect your ideal aesthetic enhancement goals and show the potential outcome of the procedure as accurately as possible. If you are not sure of your ultimate rhinoplasty goals, the photograph can be morphed until you see an image more in line with the results about which you are thinking. This technology also makes it much easier for you to visualize the possible results and discuss them with Dr. Cochran. Although no technology can predict the future with 100 percent accuracy, 3D imaging technology goes a long way in helping to ensure you and Dr. Cochran have similar goals for surgery—not to mention peace of mind about having the procedure in the first place. In short, Dr. Cochran can use VECTRA® technology to help you compare and contrast your proportions and give you a visual aid to assist you in making your decision. In the primary rhinoplasty procedure, an incision is created to separate the skin from the underlying bone and cartilage. After the skin has been lifted away, excess bone and/or cartilage is removed. In some cases, it may be necessary to add cartilage grafts to remodel the nasal structure. Lastly, the skin is carefully redraped to give the nose its new look. Depending on the needs of each patient, the change may be subtle or dramatic. The overall goal of rhinoplasty is to produce an aesthetically enhanced, natural-looking nose that functions properly and is in balance and harmony with one’s facial features. While each primary rhinoplasty patient’s wishes are always central to Dr. Cochran’s approach, there are possible limitations to what can be accomplished. Skin texture and thickness, previous injuries or nasal surgeries, individual variations in healing, and facial proportion and contour play important roles in what can—and should—be achieved with a nose job. These and other factors will be fully discussed during your consultation. 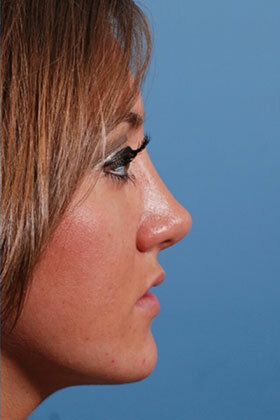 The recovery process following rhinoplasty is very important to the long-term results of your procedure. Dr. Cochran and our staff make every effort to ensure your procedure and recovery are safe, effective, and successful. After rhinoplasty, it is important to give the body time to heal. There will be varying amounts of swelling of the nose and the surrounding area. Elevation of the head and using intermittent ice compresses should help to decrease inflammation. The swelling usually reaches its maximum at 72 hours, with the majority typically subsiding over the next few days. By two weeks, inflammation should not be noticed by the casual observer. Most patients are able to return to work at this point. Residual swelling is usually only noticeable by you and Dr. Cochran and will decrease gradually. Once surgery is complete, a small aluminum frame will be applied over your nose for protection. This aluminum cast will generally be removed five to seven days after the procedure. You should be able to reduce some of the swelling after surgery by keeping your head and nose elevated higher than your heart. External sutures will generally be removed after five to seven days. You can clean the incision areas with Hydrogen Peroxide-soaked Q-tips, and apply some Mupirocin ointment to the incision sites two to three times a day until all crusting disappears. With the many advances in rhinoplasty and nose surgery over the years, nasal packing after the procedure is typically not necessary. Instead of nasal packing, Dr. Cochran prefers to use soft silicone splints to help stabilize the internal structures of the nose during the first week. These temporary splints do not completely block your nasal passages. The septal splints will usually be removed along with your cast five to seven days after the procedure. After surgery, you will have a drip pad under your nostrils to collect excess bleeding or oozing. This excess will likely only be present for the first 24 to 48 hours after rhinoplasty. The drip pad should be changed after nasal cleaning, or as necessary. You can remove the tape from your cheeks and get rid of the drip pad once you no longer need it. Continue to clean the inside of your nostrils with Q-tips soaked in Hydrogen Peroxide followed by a light coat of antibiotic ointment (Mupirocin) to prevent dried blood from crusting until your first office visit. Because of swelling after surgery, your nasal passages may be partially or completely obstructed. However, if temporary plastic splints are placed, you should not be completely blocked. You can often take an over-the-counter or prescription decongestant (i.e. Sudafed) to decrease your symptoms. There will likely be some bleeding and oozing from the nose after surgery; however, this typically lasts only about a day or two. To help prevent blood crusting, you can start cleaning the inside rims of your nostrils with Hydrogen Peroxide-soaked Q-tips. This can usually be accomplished effectively by using a gentle swirling motion. The Q-tips can be advanced as far as the cotton, and you should apply a thin coat of Mupirocin ointment after cleaning. *Recovery from rhinoplasty is unique to every individual. While these tips and recommendations are applicable to most patients, you should follow the exact aftercare instructions provided by Dr. Cochran before and/or after your surgery, which will be customized to your specific case. 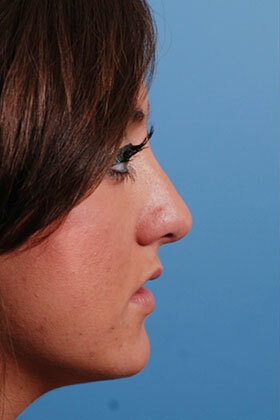 The overall cost of rhinoplasty depends on the complexity of each case. Generally, primary rhinoplasty is simpler and therefore much less expensive than revision rhinoplasty, which can be complex and involve extensive grafting. Although rhinoplasty for purely cosmetic reasons is not covered by insurance, nose surgery to correct a deviated septum, breathing problems, or other functional defects may be covered in part or in total by your health insurance company. It is always a good idea to check with your insurance agent in these instances to find out if coverage is offered. The Dallas Rhinoplasty Center accepts cash, direct wires, verified checks, MasterCard®, Visa®, American Express®, and CareCredit®—a trusted healthcare financing company. We collect the surgeon and anesthesia fees ONLY. You must pay the facility fee directly to Texas Institute for Surgery. If you are interested in CareCredit®, you can use the payment calculator to calculate your monthly payment or apply online to immediately find out if you qualify. Are Online Consultations Available for Rhinoplasty?